The first ever recorded archaeological excavations on Petersfield Heath took place over a three-week period this September. 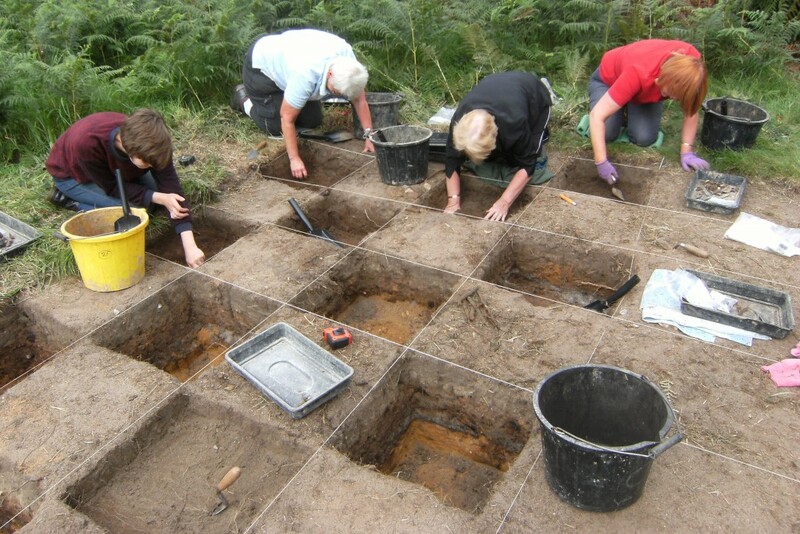 The excavations were carried out with huge local support (up to 18 volunteers assisted the archaeologists each day) and yielded some excellent results, particularly so given the formative stage of the People of the Heath project. This is true of all three sites explored, though perhaps the star find for many will be the discovery of a burial – or at least a coffin and grave goods – at the centre of Barrow 11. The wealth of evidence nationally suggests that barrows were primarily for burial and if such a context is found, then surely we must have the raison d’être for the monument. Furthermore, those finds can begin to tell us something of the incumbent and his (for it probably was a man) times and preoccupations. Figure 1: The ‘zebra’ make-up of Barrow 11 – turves interleaved with sand lenses. Pits filled with more homogeneous grey sand can be seen cutting down from the top. The western end of the ‘coffin’ lies near the base of the section directly under the soil-sample hole left of the ranging pole. We will return to the truly important grave find presently, but first we want to focus on a more humble find – the turf. Have you ever seen a prehistoric turf? If you visited the site late in the excavations you will have seen hundreds of turves in the trench walls of Barrow 11 each one a distinct black lens of soil interspersed with near-white sand – overall a veritable zebra (Fig 1). It is remarkable to behold this structure which has remained little changed for over three and a half thousand years. Just imagine yourself digging up a turf from your lawn and it surviving as a recognisable entity millennia into the future. Turves were one of the basic building materials of prehistory and they were used to good effect, especially in monuments such as barrows. But this came at a price. Any big construction project of course required labour and for the prehistoric communities who built these monuments that labour invested was a substantial outlay. But the use of turf had other consequences, such as taking grazing land out of commission and, in the case of our sandy heathlands, the exposure of loose sand highly vulnerable to erosion. These are effects that we might consider today to be ecologically unsound, perhaps even economic madness. Excavating our four-metre wide trench into the north side of the barrow gave us a vivid sense of the effort involved in constructing these monuments. Although the people of the time had bronze, they did not have metal-edged digging tools; all was achieved with wood and bone tools, organic baskets and hard labour. We too excavated the whole trench by hand and every bit of the colossal amount of soil removed was sieved. We can therefore be confident that the vast majority of artefacts will have been recovered and this includes a good number of worked flints. One interesting feature of the mound’s structure is that, aside from the later intrusions, the whole was made up of turves interleaved with sand in varying proportions. There is no obvious evidence for the multi-phase construction that is frequently found in Early Bronze Age barrows. However, there are intriguing variations in the density of the turves that need to be scrutinised from section drawings and photographs. Another question of the structure of Barrow 11 was whether it originally had an encircling ditch. A shallow ditch of unknown date was found some distance out from the edge of the barrow, but this was aligned at an oblique angle and is unlikely to be related. It is naturally assumed that prominent barrows, like many of those on the Heath, will have been dug into at one time or another by treasure seekers or antiquarians. While there were a variety of holes dug into the surface of Barrow 11, some of them deep, none looked like serious attempts to plumb its depths; indeed, some seemed simply to have been dug for the purpose of burying relatively modern ‘rubbish’ – glass bottles and an iron pail! Others could have been for digging out animals – two animal burrows were excavated in the talus of the mound. Barrow 11 is a fine looking bowl barrow about 28 metres in diameter and standing some 2.35 metres above the surrounding low-lying land. From the examination of the Lidar imagery of this part of the Heath we had begun to suspect that it stood on a very low ridge of natural bedrock running more or less parallel to the now canalised stream. Excavation confirmed that there was indeed a small elevation in the land surface, one that had been exploited to good effect by the Bronze Age builders to give added impact to their labours, but what surprised us was the discovery below the Bronze Age land surface of another, highly convoluted surface, its hollows filled with loose pure white sand. The formation of this earlier sequence will need careful evaluation by our palaeoenvironmental specialists, especially Matt Canti the geoarcharchaeologist. Provisionally it is suspected that the sculpting of this lower surface must have something to do with the tundra conditions of the last ice age or its immediate aftermath. We have not deliberately set out to find burials in this project and quite frankly we had not anticipated finding any in a four-metre wide trench which we could not be sure reached the original centre of the barrow. Burials can occur almost anywhere within, under and around barrows, although it remains true that there is frequently one near the centre. Such proved to be the case here, for we clipped a burial context right in the south-western corner of our initial trench; we were alerted by the discovery of two artefacts typical of grave goods of the late Early Bronze Age. A small extension of the trench brought much more clarity and a soil mark was identified. A little surprisingly this was at about 0.30m above the buried land surface; more usually Early Bronze Age burials were placed in graves or pits dug into the contemporary surface, whether the old ground surface or the surface of an intermediate stage of mound construction. In fact, it transpired that we were looking at was the top of a long narrow box-like structure, or ‘coffin’, that was evidently stood on the old ground surface. Not only was its shape preserved through a soil contrast from inside to outside, but careful excavation with modelling tools enabled us to detect intermittent but frequent traces of the wooden box itself. No wood as such had survived, just the ephemeral stains of decay which could easily be swept away with one stroke of a trowel (Fig 2). While one long wall of the box had remained more or less in place, the lid had collapsed under the weight of overlying soil so that it was barely a couple of centimetres above the base. It was in this narrow space that further grave goods lay. No bones, nor even the stains of bones, were encountered in the excavated part of the coffin, but one end was unreachable under the side baulk of the trench and it is still entirely possible that a pile of cremated remains lies there. Figure2: Towards the base of the ‘coffin’ – traces of the collapsed lid are visible as light brown stains amongst the black and white matrix. Two objects were initially disturbed from the northern edge of the coffin: fragments of a bronze dagger blade and a highly polished perforated whetstone (Fig 3). The subsequent finds inside the coffin were all of flint and stone, and they constitute a fascinating assemblage (Fig 4). All but one were in a neat pile at the eastern end, nine partially worked flints in two layers, topped by two small blocks of ironstone. The latter were of different grades, coarse-grained and medium-grained, and taken together with the fine-grained whetstone they could have represented a grinding/whetting tool-set. 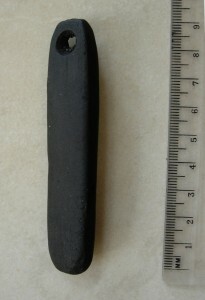 Figure 3: The perforated whetstone; a classic example of a type of object usually encountered in ‘Wessex 2’ graves. The flints are equally interesting. At least six are triangular in shape and are undoubtedly half-finished blanks for making the classic arrowheads of the period, the barbed-and-tanged type. In fact, two finished arrowheads of this type had been found earlier near the top of the mound, but it is intriguing that provision for the deceased took the form of unfinished examples. 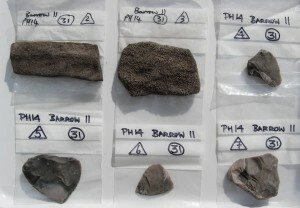 Figure 4: Some of the lithic finds from the ‘coffin’. Top left and centre are the two blocks of ironstone which were placed on top of the flint objects. Further along the coffin, probably somewhere near its middle (for we do not know its full length), we came across a single flint implement, a familiar tool known as a fabricator. Stout blades of flint were selected for their strength and one end blunted for dual use: flint-knapping and fire-lighting; ours, however, had yet another function, for the opposite end had been turned into a narrow scraper for woodworking or hide processing. The soil from which the dagger blade and whetstone came was very close to this part of the coffin, so they may have originally lain close to the fabricator. The discovery of a burial deposit really was the icing on the cake. Not only do we get the above insights into material culture of the time and into certain choices in the selection of funerary accompaniments, but it also gives us valuable chronological information. Among the grave goods, the dagger and whetstone are regarded as typical of the last phase of the Early Bronze Age. This is conventionally dated to circa 1750 – 1500 BC, but these early chronologies are still being improved. Ultimately of course, this grave group only makes full sense in the context of the human remains it accompanied – at present it tells an incomplete story. 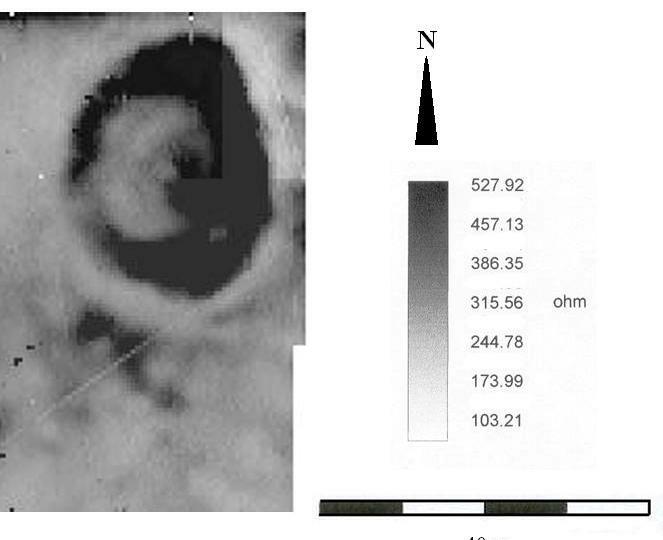 Figure 5: The geophysics plot of the Site 24 showing the oval enclosure as a dark band (representing bank remnants) encircled by a light band (the ditch fill). This was the most enigmatic of the three sites tackled this season. Rather slight traces in the ground surface make no real sense and a coherent oval plan only becomes evident from inspection of early aerial photographs and our follow-up geophysics survey (Fig 5) – see Bulletin no 1. We were keen therefore to confirm the character of the enclosing earthwork, hopefully also to find dating evidence that might show whether it related to the barrow cemetery and, perhaps even to obtain some information on its function. A narrow 36m-long trench was laid out across the shorter axis to take in the full width of the enclosure. Despite the shallowness of most of the archaeological levels, it was nevertheless a difficult site to unravel at first. The uppermost layers were heavily infiltrated by the roots of the tussock grass and further complications arose from seemingly sporadic iron-pan formation – iron minerals are notoriously mobile in these free-draining sand soils and can aggregate in dense bands or other agglomerations for varied reasons. Yet again, as for Barrow 11, some of the underlying geology was at first sight puzzling and this was exacerbated by proximity to the water table, this being only a little over a metre below the present day ground surface. Setting aside these complications, some of which we hope will be explained by specialist soil studies, we were able to document some important stratigraphic information, even in the shallow soil of the interior. The ditches proved to be dug to over a metre deep and, particularly exciting for both us and our palynological expert, Nick Branch, they descended to a little below the water table. Here in the bottom layer of the eastern ditch were preserved pieces of wood which must have been caught up with the initial sand fill of the ditch soon after it was dug or last cleaned out. The sandy sides of the ditch were of course extremely unstable and there is some evidence that parts may have been revetted with near vertical timbers – that evidence needs to be evaluated more carefully. The middle fill of the eastern ditch section also had something of interest. 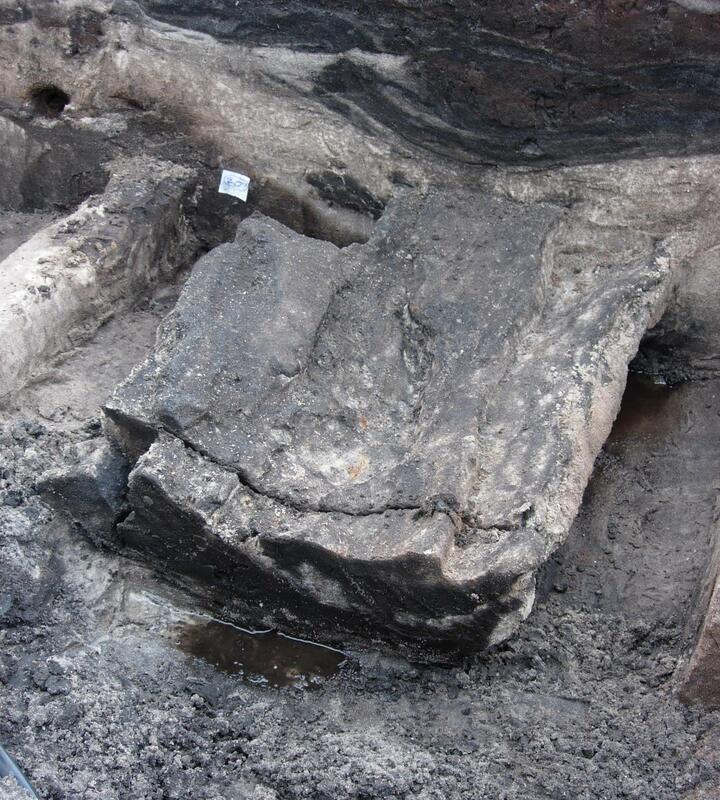 Spanning the whole of our 2-metre trench was the cast of a half-log or thick post (Fig 6). I say ‘cast’ because this layer was above the water table and the wood had thus rotted; as it did so, the void was progressively replaced by sand and sticky organic mud which remained dark brown in colour and stood in stark contrast to the pale encapsulating sand. Deterioration of the wood’s surface prevents us from knowing whether it had been worked and used prior to its abandonment in the ditch. Figure 6: The half-log in the eastern ditch section of Site 24. A slice has been cut from the front end to allow microscopic examination in the laboratory. The water table can be seen emerging at the base of the log. Inside the ditch on both sides of the enclosure were bands of soil of unusual character, rich in iron-pan pellets – another manifestation of this mobile element. These bands undoubtedly mark the position of banks that have almost entirely been levelled over time. 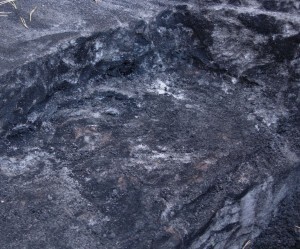 However, the debate is whether the iron-rich material was an original part of the bank, dug up from the ditch, or whether it had formed in situ owing to the particular composition of the overlying bank. Again, we may learn more after detailed consideration of the stratigraphy and micromorphological examination. The interior, inside the bank remnants, was fairly flat, but several dug features emerged some of which may prove to be contemporary with the enclosure. One of the inevitable consequences of a narrow trench, however, is that we cannot yet expect to see any pattern in the features. At present we cannot be sure of the date of Site 24. Overlooking modern material, all the finds from ditches and interior alike, were of rather fine quality flintwork. 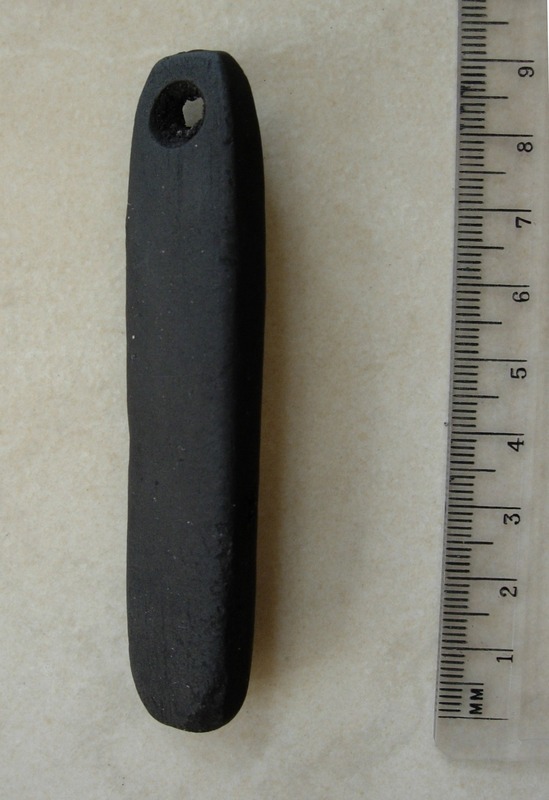 This assemblage has yet to be properly inspected, but its blade-dominated character points to the Mesolithic and earlier part of the Neolithic periods. Flints, however, are virtually indestructible and they could have already lain around this spot long before the enclosure was created. So we need some other dating evidence and some of the wood from the ditch bottom should be perfect for radiocarbon dating. Independent dates are eagerly anticipated but must await identification of wood species first, since this both aids interpretation of the results and may shed light on the woodland composition of the time. Other environmental remains will be sought from samples taken from this waterlogged layer. Although it has been known since its accidental discovery in 1907 that a scatter of prehistoric flintwork existed to the west of the nursery school (‘School on the Lake’), there had never been any archaeological follow-up to establish really what was there. We have begun to rectify this and have already shown it to be an astonishingly rich site of Mesolithic date. Three trial pits dug by Anthony Haskins (who came to supervise this area) and the project archaeologists earlier in the year had shown promise and initial assumptions that the creation of the old golf green might have destroyed all the stratigraphy began to look unfounded. 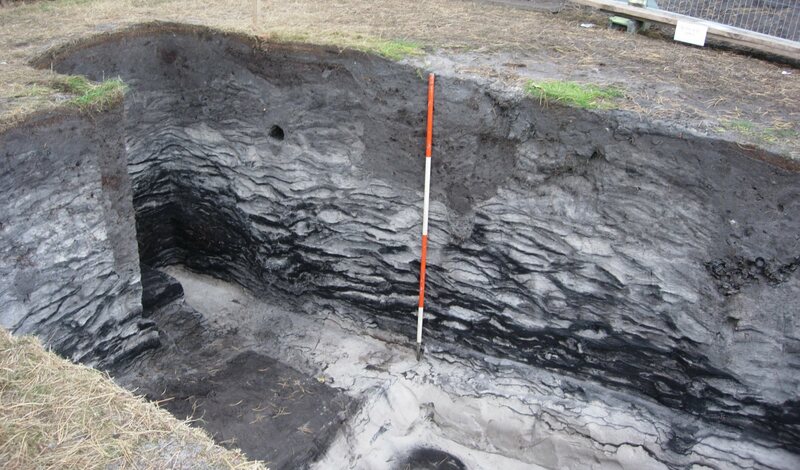 Added to this, the discovery of a possible feature within the test pit dug into the green was especially alluring; Mesolithic pits and structures are rare beasts indeed. Accordingly a trench (4 x 4m) was laid out within the platform of the old golf green. 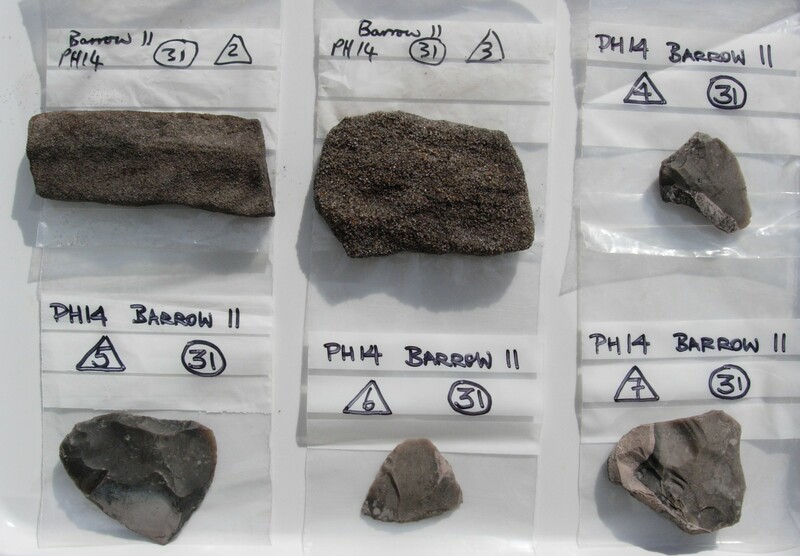 At first it seemed indeed that only the upper surface layers were disturbed in 1907; below there were thin layers that looked more ancient and these were extremely prolific in Mesolithic flints. The sub-surface feature was relocated and found to extend in a very linear fashion. Being sealed by the lower layers, it posed an enormous conundrum until eventually it revealed its secrets at the bottom – it was, as one of the competing theories had it, a 19th century pipe-trench! It suddenly seemed so obvious, but this is easy to say in hindsight. Occasional Mesolithic sites elsewhere in the country have come up with some real surprises in terms of dug features and we still have the issue of understanding the overlying stratigraphy as being entirely the product of golf green construction and maintenance. 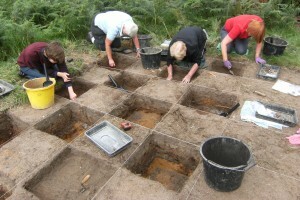 Figure 7: The chequer-board excavation of the Mesolithic site. The layers below the light brown topsoil, originally thought to be ancient, are now known also to have been disturbed in 1907. Discovering that everything had been disturbed in the main excavation trench was of course a disappointment; much care had been taken to record all the finds in half-metre squares and to each layer taken up (Fig 7). All the soil had been sieved in order to maximise the recovery of sometimes very fine flint blades and flakes. However, we do not regard this as major set-back; in these early days of the project we are still grappling with uncertain and sometimes unexpected soil formation processes; all field archaeology is a learning process, every site can be different from others even on the same base geology. From a very modest area within the golf green, literally thousands of struck flints were excavated – if these were all re-deposited around 1907, it is probable that many others were shovelled away from the green. The original density of material must have been even greater! What we have recovered is already an excellent body of material for initial characterisation of the assemblage; it includes many microliths, objects much valued for their chronological sensitivity and functional implications – Anthony’s provisional view is that the assemblage dates to somewhere in the middle of the period, very approximately 6000 BC. The Mesolithic site was used as the locus for school-party excavations (Fig 8). 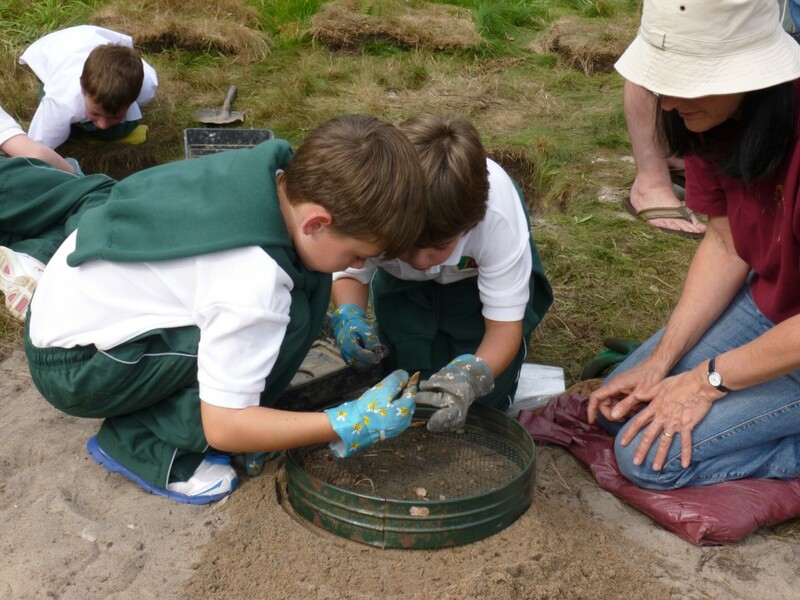 A series of small holes were opened near the edge of the golf green and the finds made by the children (under supervision) were recorded and sieved in much the same way as those from the main trench. These holes were actually informative and will help shape future archaeological strategy on Site 23. This is a great site for this kind of outreach activity; the soil is easy to excavate and the kids are guaranteed to find ancient things! Now we know that all the levels on the golf green have been disturbed to some degree, this patch can be used for school-party excavations with impunity. Figure 8: Young excavators checking for finds after sieving their spoil. There is still a very promising research future for Site 23; two small trenches were put into the ground to east and west of the golf green and here we do seem to have intact stratigraphies. Again, Mesolithic finds were prolific in the lower profiles, but amazingly the western hole also produced a few sherds of prehistoric pottery from at least two vessels. There may be more to Site 23 than at first met the eye. Our excavation plan over the course of the project is both fixed and fluid. The fixed element is that each season we aim to look at new barrows in this big complex in order to build up a wide-scale picture of activity and evolution on the Heath. For next spring’s excavations we will be applying to English Heritage to sample Barrows 18 and 21 in the southern part of the Heath. The more fluid elements are those that emerge as a consequence of past excavations and further geophysical surveys. We always suspected that the Mesolithic site, providing it still had good archaeology, would be a possible candidate for future work because it offers such a different perspective on prehistoric life from the later barrows. The oval enclosure may also now merit further exploration because it too is clearly a different class of site. However, such decisions will have to be made in light of the results of post-excavation analysis, available resources and other priorities. Yet again we must thank the Friends of Petersfield Heath for their excellent clearance of the sites we tackled in this first season. Naturally too, we are indebted to Petersfield Town Council for permission to excavate and English Heritage for granting Scheduled Monument Consent for Barrow 11. Our grateful thanks go to the three site supervisors who put themselves out considerably to take part in this venture: Barrow 11, Ken Mordle; Site 23, Anthony Haskins; Site 24, John Wildman. Also to all those who participated in the many different aspects of the excavation – right from the start of our project we have been blessed with an incredibly enthusiastic band of workers dedicated to discovering some of the archaeological secrets of the Heath. The Hampshire Museum Service was on hand in case we needed to call on them for urgent on-site conservation; they have the more sensitive finds already for checking and stabilisation. Finally, none of this could have happened without the support of our sponsors.